This is not a gangster movie. I want to say that upfront. Which as you can see is layers of sponge cake topped with whipped cream and strawberries, or sometimes a log cake (made of the aforementioned cream and sponge). No brandy soaked bricks of fruitcake to be had here. If you are a single, adult… it is date night! Kind of like what we do for New Year’s Eve. So, if you ever wondered why Christmas love songs (especially “Last Christmas” and “All I want for Christmas”) and the movie “Love Actually” is so popular here… now you know. 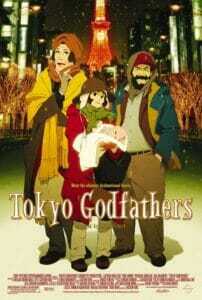 “Tokyo Godfathers” is the is a 2003 Japanese anime film directed by Satoshi Kon loosely based on Peter B. Kyne’s novel Three Godfathers. Synopsis from wikipedia: “One Christmas Eve, three homeless people – a middle-aged alcoholic named Gin, a trans woman and former drag queen Hana, and a dependent runaway girl Miyuki – discover an abandoned newborn while searching through the garbage. Deposited with the unnamed baby is a note asking the finder to take good care of her and a bag containing clues to the parents’ identity. The trio sets out to find the baby’s parents. The baby is named Kiyoko (清子), based on the Japanese translation of Silent Night literally meaning “pure child”, as she is found on Christmas Eve. So, if this sounds like something you’d enjoy this Christmas, I recommend you get thee to a DVD store or something like that!